This data set contains a shapefile of a digitized map of the land parcel information of the original properties of the Uruara colonization site, Para, Brazil, acquired from the Instituto de Colonizacao e Reforma Agraria, or the Colonization and Agrarian Reform Institute (INCRA). The Uruara settlement geometry was initially designed by INCRA, and consists of mostly 100 hectare lots (400 x 2500 meters, and 500 x 2000 meters), running north and south of the Trans-Amazon Highway, as a fine network of small, narrow rectangles. The other parcels in the landscape are the so-called glebas that range up to 3,000 hectares. The map was in the form of a paper map without a projection (a spherical geographic coordinate system) in the South American 1969 datum (SAD 1969). This paper map was digitized in Environmental Science Research Institute (ESRI) ArcInfo 8.1 using a digitizing table, and the digital cadastral data were geo-referenced and projected to match the Universal Transverse Mercator projection (Zone 22 South, World Geodetic System 1984 datum) of Landsat imagery (Landsat.org). There is one compressed (*.zip) file with this data set. The investigators were Walker, Robert T.; Reis, Eustaquio J; Arima, Eugenio; Bohrer, Claudio Belmonte de Athayde; Caldas, Marcellus Marques; Perz, Stephen G; Pfaff, Alexander; Qi, Jiaguo and Souza Jr., Carlos Moreira de . You may contact Walker, Robert T. (rwalker@msu.edu). Land parcel information of the original properties of the Uruara colonization site, Para, Brazil, was acquired from INCRA in the form of a paper map without a projection (a spherical geographic coordinate system) in the South American 1969 datum (SAD1969). This paper map was digitized in Environmental Science Research Institute (ESRI) ArcInfo 8.1 using a digitizing table, and the digital cadastral data were geo-referenced and projected to match the Universal Transverse Mercator projection (Zone 22 South, World Geodetic System 1984 datum) of Landsat imagery (Landsat.org). There is one compressed (*.zip) file, parcels.zip, which contains an ESRI polygon shape file, parcels.shp. 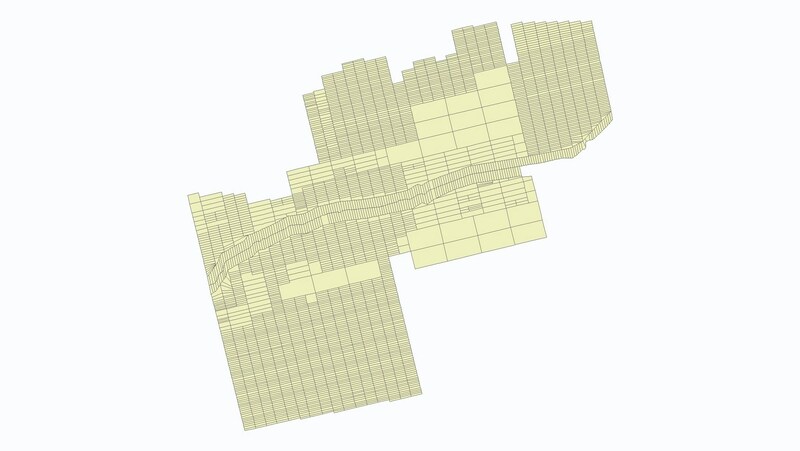 This shapefile displays the individual property boundaries. A GIS overlay function joined the digital cadastral map with the classified images, which enabled the generation of land cover magnitudes for the lots. These data were then output to files readable by statistical software, and the cover and survey data were combined for analysis. While a formal in-computer accuracy assessment has not been performed, using the Cadastral map in real-time GPS location on site has been highly successful across the entire spatial extent of the shapefile. This signifies that the shapefile is of reasonable spatial accuracy throughout. Overlaying the property map on a 1999 Landsat ETM+ image of the area resulted in +/- 60 meters horizontal accuracy and +/- 90 meters vertical accuracy. The Uruara settlement geometry was initially designed by INCRA, and consists of mostly 100 hectare lots (400 x 2500 meters, and 500 x 2000 meters), running north and south of the Trans-Amazon Highway, as a fine network of small, narrow rectangles. The other parcels in the landscape are the so-called glebas that range up to 3,000 hectares. Land parcel information of the Uruara area was acquired from INCRA in the form of a paper map without a projection (a spherical geographic coordinate system) in the South American 1969 datum (SAD1969). This paper map was digitized in Environmental Science Research Institute (ESRI) ArcInfo 8.1 using a digitizing table, and the digital cadastral data were geo-referenced and projected to match the Universal Transverse Mercator projection (Zone 22 South, World Geodetic System 1984 datum) of Landsat imagery (Landsat.org 2004). Environmental Science Research Institute (ESRI). Instituto de Colonizacao e Reforma Agraria (INCRA) (translated: Colonization and Agrarian Reform Institute). Walker, R., S.A. Drzyzga, Y.L. Li, J.G. Qi, M. Caldas, E. Arima, and D. Vergara. 2004. A behavioral model of landscape change in the Amazon Basin: The colonist case. Ecological Applications 14(4):S299. Caldas, M., R.T. Walker, R. Shirota, S. Perz, and D. Skole. 2003. The Family Life Cycle and Deforestation in Amazonia: Combining Remote Sensing and Primary Data (Ciclo de Vida da FamiÂ­lia e Desmatamento na Amazonica: Combinando Informacoes de Sensoriomento Remoto com Dados Primarios). Revista Brasleira de Economia 57(4):683-711. Pontius, R.G., Walker, R., Yao-Kumah, R., Arima, E.Y., Aldrich, S., Vergara D. 2007. Quantitative Assessment for a Model of Amazonian Deforestation. Annals of the Association of American Geographers. Caldas, M., R.T. Walker, S. Perz, E. Arima, S. Aldrich, and C. Simmons. 2007. Theorizing Land Cover and Land Use Change: The Peasant Economy of Colonization in the Amazon Basin.. Annals of the Association of American Geographers 97(1):86-110. Aldrich, S., R. Walker, E. Arima, M. Caldas, J. Browder, and S. Perz. 2006. Land-Cover and Land-Use Change in the Brazilian Amazon: Smallholders, Ranchers, and Frontier Stratification.. Economic Geography 82(3):265-288. Arima, E., R.T. Walker, S. Perz, and M. Caldas. 2005. Loggers and Forest Fragmentation: Behavioral Models of Road Building in the Amazon Basin. 95(3):525-541.